We, the Penang Arts Alliance, acknowledge the need to create a Policy for Creativity and the Arts in Penang to articulate a vision that drives our cultural and human development and broadens our horizons to bring greater respect for our cultural diversity, our arts legacies and traditions and, more importantly, our future. The vision is based on equity, social inclusion and sustainability and addresses the collective artistic needs and aspirations of the people of Penang which have been expressed in public calls for a paradigm shift in the manner in which the Arts are perceived. The Arts are central to the existence and development of our diverse communities, especially in respect of nurturing creativity and local identity and the enhancement of our social, cultural and economic capital. This belief has to be embedded in policies and programmes that are generated by the government elected by the people of Penang. By envisioning a central role for the Arts within the wider context of local economic development, the creative potential of present and future generations will be realised on a continuing basis. With freedom of expression through education, the artistic platform will naturally be widened and critical ideas and creations generated by the Arts will bring an edge of innovation and dynamism to Penang. This is building upon the inherent and comparative advantages which Penang already possesses that are exemplified by the qualities and knowledge of the people. The artistic and heritage values which underscore the originality, the history and the continuity of our Arts must always be protected, especially in the face of undue foreign influences in open media and homogenisation. The values that reside in our physical and material legacies, our artefacts and artistic creations, our living expressions and our diverse traditions are our roots which are the foundations for growth and integrity of idea. These should never be surrendered or sacrificed for economic gain alone. 1. Developing a policy for the Arts in Penang should be seen as an integral part of an overall development strategy for our state. Supporting the Arts industry is a vital component in celebrating and developing creativity, the bedrock on which the success of Penang’s economic future will be determined. Creativity is acknowledged as the crucial component for competitiveness in the global knowledge-economy. 2. The United Nations estimates that creative industries account for 7% of global GDP, and is growing at 10% per annum. In the UK, the creative sector is growing twice as fast as any other sector. Linking support for the Arts sector to initiatives in other sectors – including technology, skill training, tourism and education – will ensure that Penang is positioned to take full advantage of the rich economic opportunities afforded by the modern, global economy. The link between the Arts sector and both the industrial sectors and service sectors has been clearly established through the experience of other countries. That is one reason so many other countries and cities are investing so heavily in ‘creative industries’, which includes the Arts. Investments may come in the form of developing community-based infrastructure (performance and rehearsal facilities, lighting and sound equipment), supporting network development and exchanges between groups, investing in the development of skill acquisition and enhancement (through running or supporting a variety of trainings, workshops, and apprenticeship schemes, linking into mainstream industrial training programmes, not least in IT and related subjects), supporting actual events (including festivals and innovative events (such as an “ingenuity weekend”, providing opportunity for bringing industry and the arts together), and bringing key stakeholders in industry and the arts together in a shared vision. This can be done, for example, through the establishment of a Creative Industries Board, charged with compiling an inventory of creative industries in a location like Penang and spearheading their integration and development as a core economic strategy for both present and future. 3. As well as contributing to the economic growth of Penang, a strong commitment to the Arts will also have significant and positive impact on the cultural vibrancy and social cohesion and harmony of our state. A strong Arts policy has been shown the world over to have positive impact on community relations, on social interaction, on critical thinking and on tolerance, as well as on individual and social dynamism. All these attributes are highly relevant to our multi-ethnic Penang. 4. Supporting the Arts will also contribute significantly to Penang’s ambitions with regard to becoming a major regional tourism hub. The increasing importance of ‘cultural tourism’ must be noted, as it is a source of income which Penang is uniquely capable of attracting. 1 A policy for Penang’s Arts industry should be based on the CAT principles avowed by the Pakatan Rakyat state government, which comprises the principles of Competency, Accountability and Transparency. To these should be added inclusiveness and sustainability. 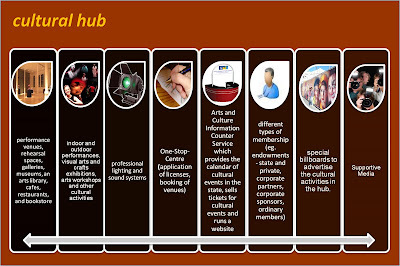 2 In formulating the mechanisms and structures by which an Arts Policy is to be devised and implemented, it should be borne in mind that the optimum outcome is that the Arts industry should be strongly rooted in our diverse and rich local experience, locally controlled and locally driven. 3 In paying heed to the principles of sustainability, a policy for Penang’s Art industry will avoid large expenditure on imported events, but rather will choose to build on the assets already owned by the Penang community. This will enhance Penang’s own capacity, expand the number of Penang people involved in the opportunities of the creative industries and secure the place of the local Arts industry in Penang’s future developments. 4 Such an approach will reflect the inspiration of the UN’s 2001 Universal Declaration on Cultural Diversity, which sets out the importance of the preservation and "promotion of the fruitful diversity of cultures". This Declaration has been taken forward through a variety of further resolutions and initiatives, such as the 2003 Convention for the Safeguarding of the Intangible Cultural Heritage and the adoption of the Convention on the Protection and Promotion of the Diversity of Cultural Expressions. Such international agreements set out a platform that links together the issues of cultural diversity, peace and development, and the role of the state in fostering pluralism. These agreements also highlight the need for policy makers to take these issues into consideration at both national and international level, and emphasise the need for promotion of intercultural dialogue. 5 It would also reflect the inspiration and principles of UN’s Local Agenda 21, to which Malaysia is a signatory. Penang has a unique combination of rich and diverse cultures, with an inspiring history in performance and visual arts, crafts and literature. It is therefore extremely well positioned to capitalise on the opportunities afforded by the developing global emphasis on the creative industries. However, commitment, coordination, consolidation and investment are crucial. 1. Traditional arts of the different communities. Penang has an amazing history of multi-ethnicism. There are so many diverse communities in Penang, each of which still maintains its own traditions, performing arts and crafts. Among traditions Penang can celebrate are boria, ronggeng, bangsawan, joget, wayang kulit, different forms of silat, kompang, Chinese opera, Chinese puppet theatre, Chinese orchestras (with different traditions within the different Chinese communities), Indian temple music and Indian dance. There are also various martial arts like Pencak Silat, Tai Chi and Silambam being practised by different communities. The influence of Penang’s various migrant communities over the centuries on performance arts as well as on visual arts and crafts adds a unique dimension to Penang’s rich cultural and artistic tapestry. 2. Tradition of street culture. Penang has also been enlivened over the centuries by ‘arts in the street’: celebrations, festivals, theatre, street markets, traders and hawkers all utilise Penang’s open streets and spaces. This provides opportunities on which to build upon. Some of the traditions have uniquely evolved in Penang, and spread to other parts of the region. The Bangsawan theatre tradition for example developed here, beginning with the influence of Parsi performers who performed in Penang in the 19th century, laying the foundations for the localised Bangsawan genre to emerge. The tradition then spread to Indonesia, Singapore and other parts of Malaysia. Penang is also the birthplace of the Boria street theatre which has spread to other parts of the country. 3. Fathers of modern South-east Asian Art. Penang has a robust tradition of visual arts. It is home to significant pioneers of modern painting (watercolour, oil and batik) in Malaysia and Singapore. They include Syed Hossein Enas, Yong Mun Sen, Kuo Ju Ping, Khaw Sia, Lee Joo For, Datuk Chuah Thean Teng, Abdullah Ariff and Tan Choon Ghee. 4. Penang’s contemporary scene. As well as being home to diverse traditional culture and arts, Penang has also played a major part in the development of more contemporary art forms. These include in theatre, film and music (exemplified by P Ramlee and Jimmy Boyle) and in the written word (exemplified by the poetry of Mohd. Haji Salleh and Cecil Rajendra). The result today is that Penang is home to a number of groups dedicated to some of the older traditional forms, working alongside more contemporary practitioners, including two symphony orchestras, many choirs, a range of theatre and dance groups, various pop and marching bands, and a lively, modern music, film, video and literature scene. Numerous art galleries have emerged, celebrating the old masters as well as showcasing a whole new generation of Penang artists. 5. Penang and innovation. The rich mix of communities and talents has meant Penang’s art scene has consistently included experimentation and innovation not least in the context of intra-cultural and cross-cultural exchange. This is a huge asset that can be positively nurtured. 1. New ideas for a vibrant future. Properly supported, the arts can foster spaces for the development of cutting edge ideas, innovative forms of expression, and demanding teamwork. All of these are exactly the sort of attributes demanded by participants in the global economy. Supporting the Arts industry will develop creativity and make a major contribution to Penang’s demand for a creative workforce capable of driving Penang’s economic future. 2. Protecting cultural traditions and promoting social harmony. An Arts industry policy will not just help protect the many highly valuable cultural traditions to be found within Penang’s communities, but will also nurture the kind of cultural exchanges that are the foundation of social harmony. Research across the world has documented the role of an active and supported arts sector in reaching across boundaries and bringing people together in a shared sense of identity, achievement and future. The Arts are a particularly powerful tool for community building – enriching the quality of life, enlivening the environment, shaping identity and contributing to the economy. 3. Providing entertainment for increasing leisure. With increasing affluence comes increasing expenditure on leisure activities. A vibrant local Arts scene can capture the economic opportunities this provides, as well as play a crucial role in stimulating intellectual thought, social connections and life enrichment. 4. Developing Penang as a regional hub. Supporting the Arts industry will help Penang achieve its ambition as the major regional hub, both in relation to the NCER as well as within the Indonesia– Malaysia–Thailand Growth Triangle (IMT-GT). It can facilitate the exchange of arts between the different communities in the region. Penang’s arts groups have plenty to share with societies in the neighbourly countries, and certainly are willing to be exposed to other art forms in the region as well. It will help develop the creativity and vibrancy vital to such achievement, as well as provide a quality of entertainment that will draw people from all over the region. 5. Enhancing Penang as a tourist destination. Consolidation of, and investment in, the Arts industry will become a vital part of Penang’s attractiveness as a tourist destination. Cultural tourism is an expanding demand and Penang is in a unique position to respond. Again, supporting the Arts, on the principles of sustainability and across a broad range of groups and activities, will be a vital part of securing Penang’s economic future. 6. Ensuring Penang is viable. Developing a sustainable and inclusive Arts sector in Penang will have several spin-off benefits in terms of providing opportunities and jobs for both professionals and younger people. In promoting a sense of pride in Penang, in helping nurture social harmony and in giving opportunity for experimentation and innovation, a strong Arts policy in Penang will not just keep professionals and young people in Penang (reversing the present brain drain that loses so much of Penang’s talents to other places) but will also attract people from elsewhere to take root in Penang. This can only be good for Penang’s future dynamism and viability. There are many opportunities available to the State government in helping develop a vibrant and flourishing Arts industry in Penang. Perhaps crucial to any success, however, is the basic mindset. It cannot be the case any more that the Arts industry is seen as an isolated sector needing isolated treatment. Rather, we must move our thinking about the arts and creative industries firmly away from the margins of policy, directly into the central discussions of Penang’s overall future. As we look to create the jobs for this future and Penang’s identity in this future, the cross-sectoral links between industry, arts, technology, science, tourism, education and environment must not just be recognised but exploited to the maximum benefit. Leading the way to ensure that arts policy is integrated into the various discussions and initiatives relating to these other sectors is a major open opportunity for the Penang state government. This will involve some medium-term and longer-term strategising. There are other, more specific areas related to the Arts which provide particular positive and more immediate opportunities to the state government. 1. Developing a coherent and transparent structure and funding policy. In formulating any system or policies to structure the Arts in Penang, the state government needs to take into account some basic principles. These include ensuring any system or policy is fully transparent and accountable, and is made as competently as possible. It is the situation at the moment that few among members of the public, or even the arts community, have any understanding of how we currently make decisions or allocate funds. We would argue therefore that our decision-making structures and our funding processes need to be more transparent. This would include a search to make the process of decision-making more inclusive, by widening membership of key decision-making bodies to allow members of the public and arts professionals to play an enhanced role. We can start with those bodies dealing directly with the Arts, but would also make the point that this should extend to bodies dealing with the concerns such as tourism, industrial development and education as well. Further, we would argue that it is crucial to provide support and opportunity to as wide a range of arts activities as possible in Penang. The aim of constructing an arts community which is broad-based, inclusive and hopefully reaches into every corner of the state should drive decision-making and funding. These activities should not be the province of an exclusive few. Further, the principles of sustainability are increasingly important. So the state government, through bodies like the Majlis Kebudayaan Negeri (MKN), needs to work closely with arts organisations, the voluntary sector, the private sector and other funders and stakeholders, to develop more effective partnerships and foster a renewed focus which will be to enable as many people as possible to experience challenging, exciting, sustainable and enriching arts. While maximising the possibilities of existing public funding, we need to be aware of the limitations the state government faces in providing adequate funding to the arts industry in Penang. Connecting arts funding to funding for other sectors (tourism, technology, skill development and so on) will be important in both expanding the base of financing and changing mindsets to understand how important the arts industry is for the overall future of Penang. But crucial too will be the ability of the state government to inspire private sector funding for the arts. Here the leadership of the state government is crucial. Defining the objectives, potential events and avenues for such funding will need to be done in consultation with the various stakeholders. Establishing an annual Penang Arts Festival, with a clear Penang identity and building on Penang’s own traditions, talents and creativity, will help provide a focus (see below). 5 develop strong leadership with regard to arts sponsorship, with the links to the private sector particularly important. Cultural infrastructure is essential for the growth of the arts. In 2008, the number of dedicated performance halls in Penang stand at eight, but only four is state-owned. These are the Dewan Sri Pinang, the Town Hall at the Esplanade, Kompleks Pustaka Warisan Seni (with Auditorium P. Ramlee) and Auditorium A Komtar . There are a number of problems facing local groups in utilising these venues, however. They include the high cost of rental, last minute cancellations of bookings for state functions and over-use of the halls, and difficulties with regard to the applying for and obtaining taxes and permits. In particular, the newly renovated Town Hall which has an excellent medium-sized performance hall has been inaccessible to NGOs because of its high rental rates and the conditions imposed. Further, amateur groups also have major difficulty with regard to rehearsal spaces, which are lacking in Penang. Groups also face problems with regard to permits and regulations, as well as tax. At the moment, in order to be able to put up a public performance with ticketing in Penang, groups need to get a several different permissions. These are from the City Council (performance license), the Labour Department, the Police (permit for performance and road block), the Fire Brigade (security) and the tax department (deposit for entertainment tax). Documents that need to be submitted include synopses of play, names of all performers and location map. The whole process of having to visit (and wait at) all these various departments to seek approval for any performance acts as a major deterrent, especially to groups that have limited resources. Amateur groups also find it difficult to put down the deposit for entertainment tax (amounting to 20% of all tickets printed). 1 Lowering and standardising the rental rates of performance and rehearsal spaces in state-owned buildings for amateur arts groups. These include Dewan Sri Pinang, P. Ramlee Auditorium, Auditorium A Komtar and the Town Hall. 2 Making accessible all public spaces such as youth centres (eg. Pusat Belia Pulau Pinang, Lebuh Acheh) to all arts groups. 3 Creating a One-Stop Centre for the obtaining of all permits (see below). 4 Abolishing the Entertainment Tax for ticketed performances. 3. Celebrating Penang’s Arts: Awareness and Information. We have pointed out the various and huge benefits of a vibrant and creative arts industry in Penang. Enriching, challenging arts create important gains for both individuals and communities, and so it is essential that as many people as possible should be able to access and enjoy high-quality arts experiences. However, there is a lot of work to be done in Penang to make this a reality. The lack of systematic information dissemination is one major obstacle to the development of a vibrant arts and culture scene in Penang. At the moment there is no centre in Penang for information and publicity of performances and other cultural activities, where audiences can also obtain tickets. Nor is there a dedicated website celebrating Penang’s arts scene. Without any central coordinating effort, it is also the case that performance groups and art galleries find it difficult to coordinate their performance or exhibition dates. Empowering people in relation to the arts – whether as performers, sponsors, or audience – is a major opportunity for the state government. There used to be an Arts and Culture Information counter service at the Dewan Sri Pinang, which also ran a website with information about arts and cultural events in Penang. Funding for this was stopped however. There is every reason and every opportunity to revive this. 3 a One-Stop-Centre for the application of licenses, booking of venues, administration of performance and rehearsal spaces, security and maintenance. 4 an Arts and Culture Information Counter Service, providing up-to-date information on the range of arts activities throughout Penang, producing and distributing an arts calendar, selling tickets for events and running a dedicated website celebrating and promoting Penang’s arts industry. In addition, different types of Penang arts membership can be created (eg. endowments - state and private, corporate partners, corporate sponsors, ordinary members) and season tickets sold as part of developing a Penang theatre and arts community. In creating awareness, recognising and encouraging the role of a supportive media is crucial. The press and other media do not just play important roles in advertising and informing audiences of performances and cultural events. Providing write-ups of the many arts activities and groups in Penang will begin to develop appreciation among the Penang public of the existence, role and possibilities of our arts industry. It will build the confidence of smaller groups and alert would-be artists, artisans and performers as to the various avenues available in Penang to pursue their interest. In this regard, it is important that official recognition be given to practitioners of performing and visual arts and crafts and to provide the means for them to work in their chosen cultural environment so that heritage is sustained. The Penang Heritage Trust and HSBC Bank have initiated the Living Heritage Treasures of Penang Awards which have been given to 8 traditional artists in recognition of their contributions to the intangible cultural heritage of Penang. This list should be expanded and recipients of the awards be recognised officially by the state. 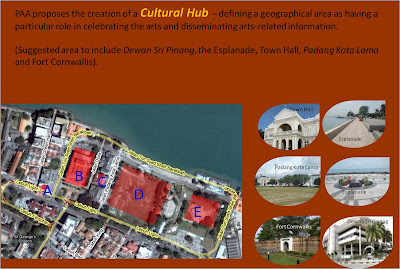 2 establish a dedicated Penang arts and culture website. 8 for the state government to actively support, promote and disseminate existing schemes such as the Living Heritage Treasures of Penang Awards. A properly planned annual Arts Festival can play the role of encouraging, extending, and inspiring the local arts sector, as well as providing a ready-made avenue for the attraction of private sponsorship. Of course it can also hugely enhance the name of Penang and its reputation, and in so doing would attract bigger and wider audiences, both local and foreign. The potential impact is therefore significant both on the arts industry and on Penang’s vibrancy and economy as a whole, not least the tourist economy, and not least on its ambition to become the regional hub. Further, arts festivals which include diverse multi-cultural groups (local and foreign, mainstream and experimental) encourage the sort of cultural interchange and cross fertilisation which builds the vibrancy and innovation crucial to the sustainability of our local arts and culture scene. At the same time, an arts festival creates the possibilities of attracting new and cross-over sponsors and audiences, making a wider range of arts available to a wider range of people. This will contribute to broader outcomes for communities and society as a whole. puppet theatre (shadow and three dimensional); gong instruments (gamelan, piphat, kulintang etc); drums and percussion ensembles; orchestras (Chinese, Indian, Malay, western); pantun and poetic forms; textiles; visual arts; masks (topeng); traditional medicine; crafts; lion and dragon dances; opera (bangsawan, chinese opera, zarzuela, ludruk etc); and various ethnic musics from around the world (local and pop idiom). In committing to it, the Penang state government would create the possibility of a major flagship event, which in time will make us recognised as a leading world centre of heritage, culture and tradition. It will dovetail with Penang’s efforts in relation to being a World Heritage Site; it will be able to draw on the vitality of the region in contributing to the Festival of traditional performing arts; it would dovetail too with Malaysia’s tourism slogan: Malaysia Truly Asia. In supporting the Arts Festival, with private sponsorship a crucial funding element, the state government would not be deserting other arts activities or other on-going Penang annual festivals. But having a unique Arts Festival relevant to Penang’s own assets and heritage will have the spin-off effect of stimulating interest and widening participation, in Penang generally and in the arts scene in particular. This will create an even broader base of performers, sponsors and audience. - The Penang Island Jazz Festival. The festival, mooted 4 years ago by Penangite musicians led by Paul Augustin, has drawn high-level artistes from various continents to perform here. The Festival also features a minimum of one Penang based or Penang born artist or group every year. It also features Penang-based artists in the Fringe Stage and also as Workshop Facilitators. The Festival acknowledges and promotes one of Penang ’s foremost Composers and Arrangers – the Late Jimmy Boyle. It also highlights a Jazz Gallery carries stories, newspaper clippings and photographs on Penang Jazz personalities such as Jimmy Boyle and David Ng. - The Penang Island Sculpture Project. Started by Hitori Nakayama and the Penang Earth Group (a voluntary arts promotion group), the Penang Island Sculpture Project sets the vision to have sculptors from all corners of the world contribute to turning Penang into a one-of-a-kind sculpture isle. It is an ongoing programme to create 50 original sculptures on as many sites at different and diverse locations. The first international sculpture, which has been installed at KOMTAR, is by Katsumi Mukai. In the pipeline are sculptures by Kikuchi Mitsuo (Japan, ready for installation), Heng Eow Lim (Malaysia, ready for installation), Hitori Nakayama (Malaysia, ready for installation), Jiradej Meemalai (Thailand, ready for installation) and Teguh Ostenrik (Indonesia, in progress). The sculptures are donated to the State. Funding through individual sponsors is provided only for materials, travel, board and lodging. The project is presently hampered by a lack of sponsors and recognition. - The Penang State Art Gallery. The gallery has a permanent collection that includes priceless artworks created by the old masters of Penang. It also has regular series of exhibitions featuring individual artists as well as organisations such as the Penang Art Society, Penang Watercolour Society, Penang Teachers Arts Circle and the Penang Oil Painting Society. Public awareness of activities and resources that the gallery has is rather poor and can be improved upon. Programmes can be introduced to expose the gallery to schools, and educational and cultural organisations. The state government should look at possibilities of promoting cultural exchanges and arts education programmes within the state, at local levels, to enhance the arts industry’s contribution to cultural understanding, mutual tolerance and social harmony. Further, support for learning and research will be crucial in allowing Penang to develop as a leading venue for the nurturing and innovation in the local and regional arts industry. For example, using the Penang Traditional Arts Festival as a focus, local and invited artistes from the regions could facilitate practical workshops and talks on music, dance, theatre, visual arts, design, craft making or literature for local practising artistes, school children and college students. These practical workshops would not only create intercultural exchange through jamming sessions but expose participants to different types of traditional and contemporary arts of the Asian region and raise their awareness about how traditional performing arts can be contemporarised so that they are relevant to the times. Workshops on how traditional crafts can be branded and enhanced by modern design and marketing strategies could promote economic sustainability among traditional artisans. Developing this kind of commitment would allow present and future Penang arts and cultural activities to flourish in a shared framework. It would enhance the kind of work being done, for example, at the Little Penang Street Market in terms of showcasing crafts, performance and visual arts by local artisans and artists. Commitment to research and documentation would also ensure that traditional art forms are adequately documented for future generations and the impact of change as a result of globalization on traditional and contemporary arts be captured to form the basis for lively discussion and innovation. A particular facility that is important for archival and documentation of projects held in Penang is the Public Library. The International Federation of Library Associations and Institutions (IFLA)/UNESCO in its Public Library Manifesto, recognises the Public Library as the “the local gateway to knowledge, provides a basic condition for lifelong learning, independent decision- making and cultural development of the individual and social groups.” A Public Library which is well endowed with a range of print and digital information resources and that provides a range of services for all communities, is a powerful force for education and culture. It is ideally suited to this purpose as it is an institution that is open to all peoples of the state irrespective of age, gender, race, social status, religious affiliation, and citizenship status. It also caters for all members of the community irrespective of their personal skills and abilities. The library can act as a centre for research and learning for arts and culture in the state, while housing archives of important documentations of the state’s cultural activities and artistic history. It can also have its arts collection expanded and strengthened to house as wide an array of materials for Penangites to be able to refer to. It can also provide spaces for intellectual interaction and artistic practice – for training and performance. Bringing the arts industry into the centre of strategic planning for Penang’s future will need us to make and nurture the kind of inter-sectoral connections that have been mentioned earlier. Firstly, Penang (and Malaysia) should be aware of the experience of other places where integrating arts into school curricula has had huge impact both on grades and on the quality of persons produced by the system. This is related to the fact that the new economy demands higher-order skills such as creativity, adaptability and teamwork. However, as is the subject of on-going discussion at federal and state level, our schooling system focuses on “basic” academic skills, with the major emphasis being on testing and discipline. The ‘gap’ between what is taught at school and how, and the skills needed to maintain our competitive edge, is one that everyone acknowledges we need to bridge. Other countries are proving that integrating the arts into the core of the academic programme is one highly productive strategy. Secondly, we need to establish the creative industries as a central engine of our economy, driving innovation, and contributing above their weight to the vital task of growing our economy. The state government can take the lead, even at federal level, in recognising the vital contribution of the creative economy, including the arts, and in working pro-actively with the industry (including investors) to meet and, where possible, anticipate their needs. Part of this will be to build an unrivalled pool of talent for industries and investors to draw on, which may well involve the state government in developing the same formal, structural support for the creative industries as is associated with other industries, such as assistance with infrastructure and skills development. Including the local arts industry in initiatives such as the recently announced Penang Science Park and a Skill Competency Centre (to draw in more cutting edge technology investments), and other InvestPenang discussions, would be a start. The arts industry should also be centrally included in the search for ways to help develop entrepreneurship and business developments in creative industries, through developing appropriate training, apprenticeships and/or seed funding. The Arts Council in England, for example, is very much a part of delivering the objectives of the UK’s Creative Economy Programme. In summary, the state government has a fundamental role and some major opportunities in providing leadership and public funding to stimulate creativity and sharpen Penang’s creative edge. Support for the arts, based on the principles noted above, underpins a future for Penang which values excellence in the arts, an innovative and flourishing creative economy, and a cultural vibrancy which will enhance both individual confidence and social cohesion. There will be links to a stronger skill base, with, in the longer-term, an expanded range of creative job opportunities with clear routes into creative careers from local schools and colleges. A strong arts industry will also contribute to the strength of our tourism sector, and will be a major part of securing a dynamic, successful, innovative and sustainable future for Penang. We look forward to being a part of it. The Penang Arts Alliance (PAA) comprises an assemblage of diverse art-groups with a shared passion and vision based on equity and social inclusion for the development and sustainability of the Arts Industry in Penang. PAA acknowledges that the formulation of a Policy for Creative Arts based on the CAT principles avowed by the Pakatan Rakyat state government will enable PAA to articulate this vision. Given Penang’s rich legacy and ongoing celebration of the creative arts - music, visual arts, theatre, storytelling, and multi-ethnic performance culture, Penang is set to play a central role for the Arts Industry within the wider context of the state’s development. PAA is therefore convinced that the Arts Industry can provide Penang with a dynamic and innovative edge. This in turn will have a significant and positive impact on the cultural vibrancy, sustainability, social cohesion and harmony of our state. Support for the local Arts scene will also contribute significantly to Penang’s target of becoming a major regional tourism hub. Ø The Arts industry should be strongly rooted in our diverse and rich local experience, locally controlled and locally driven. It should be built on the assets already owned by the Penang community. Ø PAA proposes the creation of a cultural hub – defining a geographical area as having a particular role in celebrating the arts and disseminating arts-related information. (Suggested area to include Dewan Sri Pinang, the Esplanade Town Hall, Padang Kota and Fort Cornwallis). Ø PAA proposes the support of an iconic arts festival e.g. Penang Traditional Arts Festival as a flagship event that celebrates Penang as a leading world centre of heritage, culture, tradition and the creative arts. Ø PAA proposes the setting up of an Action Committee comprising active members from the arts community and public sector departments of government to monitor, network, champion and manage the arts industry in Penang. - abolish the Entertainment Tax for ticketed performances by NGOs. - the state government to actively support, promote and disseminate existing project events such as the Living Heritage Treasures of Penang Awards, Penang Sculpture Project and the Little Penang Street Market. - To promote cultural exchange through workshops and educational programs such as Anak-Anak Kota, PESSOC (Junior Orchestra), PSO, Temple of Fine Arts & schools Boria competition. The Penang Arts Alliance comprises diverse arts groups and individuals who share a common vision for the enhancement of the arts in <?xml:namespace prefix = st1 />Penang. This group was formed after the meeting of NGO’s at the PENANG FORUM (organized by the Coalition of NGO’s) at Disted College on 13 April 2008. PAA includes artistes, arts administrators, critics, producers, academics, librarians, students and writers actively involved in visual arts, theatre, music, dance, film, literature, new media and craft making in Penang. Presently, the membership of PAA consists of arts groups and individuals who were part of the PENANG FORUM (see list below). We are aware that there are many other arts groups and concerned individuals in Penang and will be inviting them to join PAA in the near future.